This month’s theme for Lasang Pinoy is almusal, which is what we call breakfast, and just so happens to be my favorite meal of the day (yes, big surprise, I know). As this was my first ever time to host a food blogging event (and one so near to my heart at that), you can imagine I was very excited. This month we are honoring a very important, yet oft neglected, meal. The meal that starts our day and gets us going during the tough work week. The meal that we linger over with a good book and pj’s on lazy weekends. Breakfast: We love you! Breakfast in the Philippines is a whole wonderful affair unto itself. It is much larger and more filling than breakfasts elsewhere, consisting many times of a meat/fish dish plus rice, and eggs even. The term Pinoy Breakfast brings happy memories and tummy rumblings to many Filipinos all around the globe. Each Filipino will have his/her own favorite although there are some “classics” that stand out in everyone’s mind. This is one of them. Tuyo is a dried salted fish (tuyo actually meaning dried). 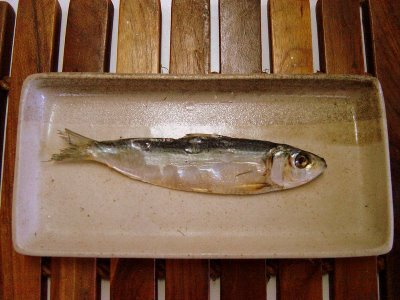 The process of salting and drying preserves the fish and you can actually safely store this for some time. This is done to a number of kinds of fish so you can have different variants of tuyo. Tuyo has been touted as a poor man’s kind of dish as can be procured quite cheaply (and as it is “preserved” can be stored cheaply too!). Poor man or no, tuyo has legions of fans from all walks of life, so I like to instead think of it as an everyman’s kind of dish. And as far as tuyo lovers go, I am right there heading the pack! For this post I used four different kinds to come up with a little tuyo sampler breakfast. You can see them in the picture below. From the front is tonsoy, which is one of the more typical types. Then it is followed by sapsap, which is shorter, thinner, but wider. Then the one behind that is lapad, which is much like tonsoy. The last fish all the way at the back is espada, which is long and thin, and super crunchy when fried right. It is also less salty. I suppose for the uninitiated tuyo can be quite a shock. It’s saltiness is so palate cleaving that your entire troup of tastebuds stand at attention. For me, there is nothing that quite compares. It is very simple to prepare, just fry in very hot oil and serve. 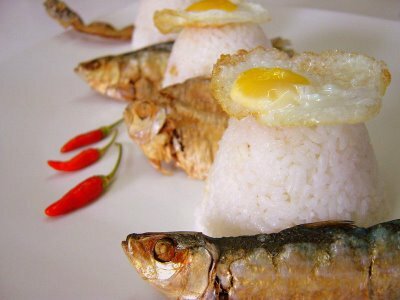 I have presented it here in the most traditional way…with sinangag, which is garlic fried rice, and a fried egg. However, I used quail eggs instead of chicken eggs, and smaller portions of rice, to give it a feel of small tasting portions. A tuyo degustation menu if you will. Of course, anyone who eats tuyo would know that it is consumed with vast amounts of rice! I eat this with native vinegar flavored with a crushed sili labuyo (chili pictured above…very spicy!). 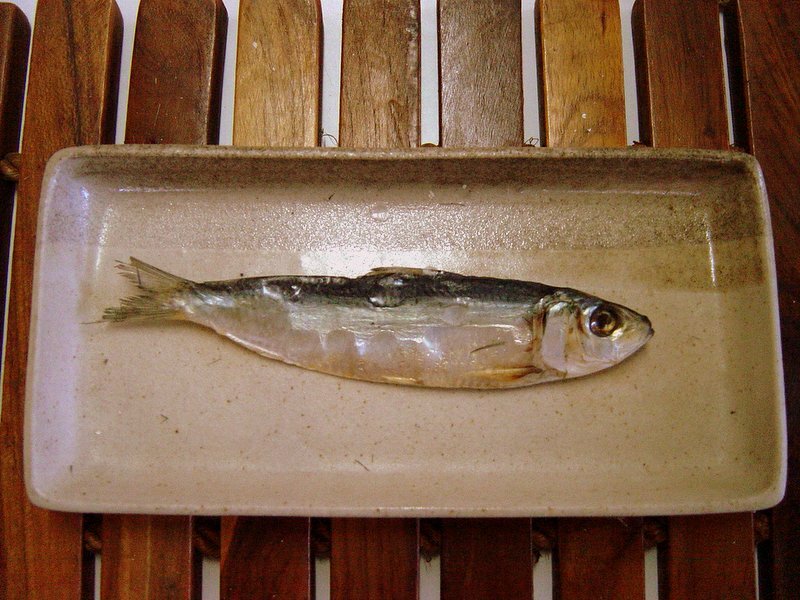 My favorite part of the tuyo is the head (as with any fish). It is such an intense concentration of flavors that it almost brings tears to my eyes. If fried right to the perfect crisp point you can eat the entire head. Yes, just dip it in some of the aforementioned vinegar, pop the whole thing in your mount, but chew carefully. It’s a salted fish flavor explosion. Well, I have come to the end of this breakfast, but there is still more to explore. Come see the round up, which I will be posting in a couple of days, to see more Pinoy Breakfasts! I haven't eaten tuyo in a long time! This post made me crave it even more. And I'm also drooling for it. Haha. My experience of tuyo and sinangag wont be complete without the mood. As my fondest memories of eating tuyo was during the rainy days and with our hands. My dad cooks it better than my mom. Coz he would fry the rice on the left over oil from the tuyo. Yummmy! i got a gift from someone who came from manila: "smoked and dried tawilis" WRONG! the fish not tawilis but "tonsoy" or sardinella"…buyers are duped by fake fish being sold as "tawilis" but in reality, it is "tonsoy" from the sea! not from taal lake or laguna de bay!